With the help of the STAR Labs team, Barry "The Flash" Allen protects the people of Central City from powerful new threats - especially the evil Zoom. With Season Two of The Flash, the “World’s Fastest Man” returns for more TV action and adventure. 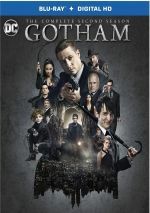 This four-disc package includes all 24 episodes from the show’s second year. The synopses come from the Blu-ray’s liner notes. Though “Saved” takes place months after the end of Season One, it looks at the aftermath of that year’s events. It does so in a fairly dramatic manner, which means it manages to turn into a good show. The new villain doesn’t work, but the emotional impact adds depth. In the comic book work, Garrick was the original “Golden Age” Flash. When they “rebooted” Flash as Barry Allen in the mid-1950s, eventually DC came up with the “multiple Earths” concept that allowed both to co-exist. The “multiple Earths” notion was always confusing but fun, and “Worlds” uses it pretty well. The presence of a second Flash – albeit one sans powers at this time – adds intrigue and helps make this a solid show. The Snart family offered some of Season One’s most interesting moments, so I welcome their return here. With the introduction of Papa Snart, matters become more intriguing, and Michael Ironside gives the evil patriarch the right sense of cruelty. These factors add up to a good episode. 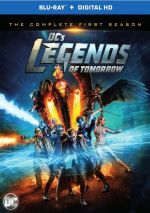 Because Season One of Legends of Tomorrow hit Blu-ray before Season Two of The Flash, I knew about this episode’s events before I watched it. Legends debuted in January 2016, whereas “Fury” aired in October 2015. For consistency’s sake, I guess Warner should’ve released the Flash BD first – or I should’ve watch the series when it initially ran. Even though “Fury” feels someone like old news since I watched S1 of Legends, it still manages some useful story information. The subplot related to Iris’s mother gets into soap opera territory, but the action elements fare pretty well. Though parts of “Darkness” entertain, the episode feels a little more in the soap opera vein than I’d like. Even the identity of Dr. Light comes across as more melodramatic than I’d prefer. While not a bad show, “Darkness” seems mediocre. It does offer more foreshadowing of Legends of Tomorrow, though. Dr. Light remains a lackluster character, so her continued presence means “Zoom” doesn’t do much to top “Darkness”. Some action spices up matters but I have to admit S2’s overall narrative is starting to lose my interest. I thought S1’s Grodd introduction worked well, but “Warfare” seems less successful. Some of that stems from its “very special episode” vibe, as it focuses on Barry’s loss of confidence. We still get some good action but the show leaves me a little cold. Referred to as “Episode 8a”, this acts as part one of a two-part “epic crossover event”. I’ll save my comments until I get to Episode 8b. Given that the pursuit of Vandal Savage forms the primary narrative for Legends of Tomorrow, I don’t think it qualifies as a spoiler to reveal that Flash and Arrow don’t defeat him. Of course, audiences who watched “Today” and “Yesterday” when they first ran in December 2015 didn’t know that – as I related earlier, Legends didn’t debut until January 2016 – but those of us who came the shows later find a decreased level of tension. Nonetheless, the “Legends” episodes entertain. I like the Arrow crossover, and the inclusion of so many heroes adds life to the series. Even without a ton of tension – and with a feeling that the programs exist mainly to set up Legends of Tomorrow - these two shows offer more excitement than we’ve seen in a while. By the way, note that “Legends of Yesterday” actually provides an episode of Arrow, not Flash. Since the two shows crossed over, its inclusion here becomes mandatory – as does the presence of “Today” in the Arrow Season Four package. After the big crossover, “Running” comes back with a three-pack of baddies. That approach goes well, as it creates a nice level of fun and excitement. The three villains give the show flair to make it a solid re-entry to the standard narrative following the two-part “Legends” shows. Normally I would appreciate a series’ attempt at a major overall story arc, but in the case of Flash S2, I prefer episodes that focus on various villains and less on the season-long narrative. That helps make “Energy” better than average – while it continues those character developments, the time-slowing baddie gives the show excitement and energy. After a couple of good semi-standalone episodes, “Returns” immerses us in the main narrative again – and mediocrity results. My problem isn’t with the overall arc – my issue comes from all the soap opera melodrama we find along the way. “Returns” still offers some excitement, but it suffers from a dip after the last few shows. With a scary new villain in tow, “Fast Lane” comes with a lot of potential. However, it only capitalizes on those areas occasionally, as a lot of it bogs down in the same character tedium. In particular, Wally West’s arc isn’t getting any more interesting. Alternate universe stories usually offer fun experiences, and that holds true here. “Welcome” gives us an entertaining take on the similarities/differences found on Earth-2 and also manages to ramp up the action well. “Escape” brings various events to a head in a lively manner. While I’ve not always enjoyed the path S2 took to get here, I think “Welcome” and “Escape” manage to bring matters home in a satisfying manner. Expect a lot of excitement here. Though “Escape” seems like an end to the Earth-2 material, that’s only partly true. “Shark” explores the ramifications of those events and sticks Flash with a big scary baddie. It’s not quite as dynamic as I’d like, but it’s a mostly good episode. Even with a new villain, “Trajectory” comes across as somewhat limp. We get too much soap opera material and not enough good action. The show feels like it should work better than it does, so it ends up asa mediocre program. Time travel stories can be fun – or they can be cheap and cheesy. I won’t call “Back” “cheap” or “cheesy”, but it doesn’t provide the thrills I hoped to get. The show gets better as it goes but remains less than stellar. Much of “Versus” finds the crew in touchy-feely mode, but the action does kick into higher gear as the episode progresses. Some good revelations about Jay add bite and make this one satisfying by the time it ends. I thought the Earth-2 adventures would end a while ago, but they continue here. The biggest shift comes from Barry’s loss of powers – call me crazy, but I suspect he’ll get them back before long. Contrivances aside, “Normal” comes with enough intrigue to succeed. This episode exists mainly to amp up the threat from Zoom. Honestly, I have to admit I look forward to the season’s end just because this thread got tiresome for me a while back. “Rupture” comes with some interesting twists/drama but it still leaves me eager to see the whole shebang conclude so I don’t have to watch Zoom any more. With the quirky title and Kevin Smith as guest director, I thought “Dinosaur” might go for a lighter/more comedic vibe than usual. The opposite proves true, as much of the show sticks with Barry in limbo where he talks with physical representations of his speed abilities – really! That’s not a recipe for an entertaining show. The bits with Barry in contemplative mode tend to drag and they feel like they exist for contrived emotion. A few of the bits with Girder entertain but “Dinosaur” falls flat much of the time. Like many other S2 episodes, “Invincible” comes with some good moments, but it gets too bogged down in its own introverted melodrama. That remains my biggest problem with S2: it tries to make Flash into a darker than usual vibe and this doesn’t work especially well for the character. “Invincible” occasionally comes to life but it doesn’t leave me excited for the finale. I won’t say that “Race” brings S2 to a merciful end, as that would offer too much criticism for the year. While it’s clear I didn’t enjoy S2 nearly as much as I liked S1, it’s a good year – it’s just been spottier than I’d like, especially based on the pleasures of S1. This renders “Race” as a decent but not great finish to the year. While it comes with the requisite drama and action, it doesn’t soar for me simply because I found it so hard to buy into the season’s overall narrative. None of this makes “Race” a bad show – or S2 a bad collection of episodes. Overall, S2 works moderately well and gives us reasonable entertainment. However, Season One set the bar pretty high, and I don’t think S2 lives up to the first year. I still think Flash shows potential and I look forward to Season Three, but S2 turns into a moderate disappointment. The Flash appears in an aspect ratio of approximately 1.78:1 on this Blu-ray Disc. Like Season One, Season Two came with very good picture quality. Overall delineation seemed strong. A handful of wide shots gave us a smidgen of softness, but definition usually appeared tight and accurate. No issues with jagged edges or shimmering occurred, and I witnessed no edge haloes or source flaws. As was the case with S1, S2 delivered a palette heavy on teal and orange. The discs reproduced those colors with good fidelity. Blacks appeared dark and dense, while shadows seemed clear and smooth. This was a satisfying visual presentation. Fans who saw S1 will also know what to expect from S2’s DTS-HD MA 5.1 audio. Given the series’ TV roots, the soundscapes didn’t dazzle, but they opened up the shows well. This meant a reasonable amount of action from the various speakers. The mixes concentrated on the front but they added a fair level of involvement from the back speakers. These tracks created a pretty good sense of place and popped up life during fight sequences. Audio quality worked fine. Music was full and lively, while speech became natural and distinctive. Effects appeared accurate and dynamic, with good range. While the audio’s TV origins held back its potential some, the tracks still added life to the shows. Deleted Scenes accompany 11 episodes. We find sequences for “The Man Who Saved Central City” (three scenes, 5:26), “Family of Rogues” (one, 1:53), “The Darkness and the Light” (1, 1:00), “Gorilla Warfare” (1, 0:54), “Running to Stand Still” (1, 2:28), “Potential Energy” (2, 3:18), “Welcome to Earth-2” (1, 1:14), “King Shark” (2, 3:34), “Versus Zoom” (2, 1:40), “Back to Normal” (1, 0:56) and “The Runaway Dinosaur” (1, 1:27). The majority of these snippets offer minor expansions of character domains. A little action pops up, but in general, the clips veer toward exposition and minor character beats. While some mildly interesting tidbits emerge, I can’t claim that any of them seem important or memorable. Many featurettes spread across the set. 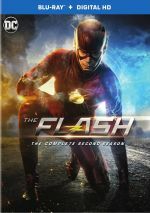 On Disc One, Barry and Iris: New Beginnings lasts seven minutes, 35 seconds and provides notes from executive producers Andrew Kreisberg and Greg Berlanti, DC Comics CCO Geoff Johns, and actors Grant Gustin, Candice Patton, Rick Cosnett, and Jesse L. Martin. We get reflections on characters and the Barry/Iris relationship. A few minor insights emerge but the piece feels fairly forgettable. With Visual Effects: 360, we find a two-minute, 13-second clip with notes from executive producer Gabrielle Stanton and visual effects supervisor Armen Kevorkian. “360” provides quick thoughts about the series’ computer-generated effects. It’s too short to tell us much. Next comes Whose Helmet Was That?, a four-minute, 23-second featurette with remarks from Kreisberg. “Helmet” looks at the Jay Garrick Flash and his involvement in S2. Like its predecessors, “Helmet” comes with a minor smattering of details. During the four-minute, 13-second Rogues Gallery: One Cold Father, we hear from Kreisberg. He gives us some thoughts about the Snart family, with an emphasis on the patriarch. Short and disappointing, Kreisberg does little more than summarize what we already know from the shows. Heart and Heat fills four minutes, 49 seconds and boasts statements from Kevorkian. The show focuses on character design and CG effects. We find some nice notes. We learn more about effects via Earth 2. It goes for two minutes, 38 seconds and involves Stanton and Kevorkian. They tell us a little about CG character work for S2. It’s not bad but like many of these reels, it’s too short. Up next we find Cutting Teeth. This one spans five minutes, 18 seconds and provides details from Kevorkian and 2D compositing supervisor Gevork Babiytan. They look at the design and creation of the “King Shark” character in this moderately informative piece. Another look at a Season 2 character, The Power of Dr. Light fills five minutes, 43 seconds with comments from Kreisberg and Kevorkian. As expected, we learn about various aspects of the Dr. Light character. It becomes a reasonably effective overview. After this we find Into the Breach. It takes up four minutes, 54 seconds with statements from Kreisberg and Kevorkian. “Breach” tells us about aspects of the series’ version of Earth-2. We find another short but efficient recap. Disc One ends with a Gag Reel. It lasts 12 minutes, 29 seconds and delivers the usual silliness and mistakes. 12-plus minutes seems like too much, and the running time makes this compilation grow stale. On Disc Two, Behind the Story runs six minutes, 54 seconds and involves Berlanti, Kreisberg, and Gustin. They discuss Gustin’s casting and we see a lot of his screen tests. A similar piece appeared in the S1 set – where it makes a lot more sense – but this one is longer and shows more of the actual screen tests. That makes it a nice addition, even if it’s semi-redundant for viewers of the S1 package. With Grodd Lives!, we find a six-minute, 51-second reel that offers details from Kevorkian, Kreisberg, and Berlanti. As anticipated, “Lives!” examines the methods used to bring the CG Grodd to the screen. It acts as a good overview of the techniques, with an emphasis on updates for S2 Grodd. Star Crossed Hawks breaks into two pieces: “Star Crossed Hawks” (11:20) and “The Hunt for Vandal Savage” (11:02). In these, we hear from Kreisberg, Johns, Kevorkian, DC Comics co-publisher Dan DiDio and Arrow executive producer Wendy Mericle. The featurettes look at comic book roots for Hawkman/Hawkgirl and Vandal Savage as well as the ways they came to the series in S2 – and in Arrow S4. The two programs encapsulate a mix of elements well. Part of a series, Visual Effects – A Closer Look takes up two minutes, 51 seconds. It features Kevorkian and he discusses the CG techniques used for Hawkman/Hawkgirl, King Shark and Grodd. We locate another short but efficient piece. Disc Two’s extras conclude with Christmas In a Flash. It runs four minutes, 36 seconds and delivers notes from Kreisberg. The show gives us some thoughts about the “Running to Stand Still” episode. It offers a smattering of insights but feels pretty general. Over on Disc Three, we find a clip from the 2015 PaleyFest. This takes up 29 minutes, 54 seconds and involves Kreisberg, Gustin, Berlanti, Cosnett, Patton, Martin, and actors Tom Cavanagh, Danielle Panabaker, and Carlos Valdes. “PaleyFest” looks at the adaptation of the comics, cast, characters and performances, story areas, and related domains. Group chats of this sort tend to be general and promotional, traits that hold true here. Moderator Aisha Tyler adds more life to the proceedings that we usually get, but we still don’t really learn a ton. A similar piece, we go to a 2015 Comic-Con Panel. It runs 15 minutes, four seconds and features Gustin, Berlanti, Kreisberg, Patton, Cavanagh, Panabaker, Valdes, Johns, and actor John Wesley Shipp. “Comic-Con” delivers a discussion similar in scope and tone as “PaleyFest”. It does hint at S2’s events but since we already own S2, who cares? It’s a promo piece. Visual Effects gives us two short clips: “Sticky Situations” (2:18) and “Superheroes and Villains” (3:05). In these, Kevorkian delivers the expected thoughts about various effects topics. This is a decent pair of segments, though more general than usual. With Disc Four, we locate The Many Faces of Zoom. The six-minute, 25-second featurette provides notes from executive producer Todd Helbing and Aaron Helbing, co-producer Geoff Garrett, and actors Tony Todd, Teddy Sears and Ryan Handley. The show offers thoughts about the Zoom character and how he came to the TV screen. It offers a smattering of good insights. A long documentary, Chasing Flash fills 51 minutes, 40 seconds and focuses on guest director Kevin Smith. It includes statements from Smith, Aaron Helbing, Todd Helbing, Patton, Cavanagh, Kreisberg, Gustin, Martin, Shipp, Valdes, and key set PA Michael Debarros. “Chasing” looks at Smith’s experiences on the series. For a show the nearly lasts an hour, we don’t learn a whole lot. Mostly we get lots of happy talk about Smith’s participation and Smith congratulates himself on how much more mature he is now than he was in the past – y’know, back when he made good movies. “Chasing” offers a surprisingly dull experience. Another visual effects piece, Everything Falls Apart lasts three minutes, 21 seconds. It delivers material from Kevorkian, as he discusses both effects as well as his role in the director’s seat. This turns into a decent little overview. After a fine initial year, I hoped Season Two of The Flash would work even better. Unfortunately, S2 seems less engaging, as it gives us a generally entertaining but somewhat disappointing collection of shows. The Blu-rays deliver very good picture and audio along with a long roster of supplements. I mostly like S2 but think the year fails to live up to the expectations set by S1.